HANNIBAL, NY – Hannibal High School teachers and students have united to bring back school spirit. 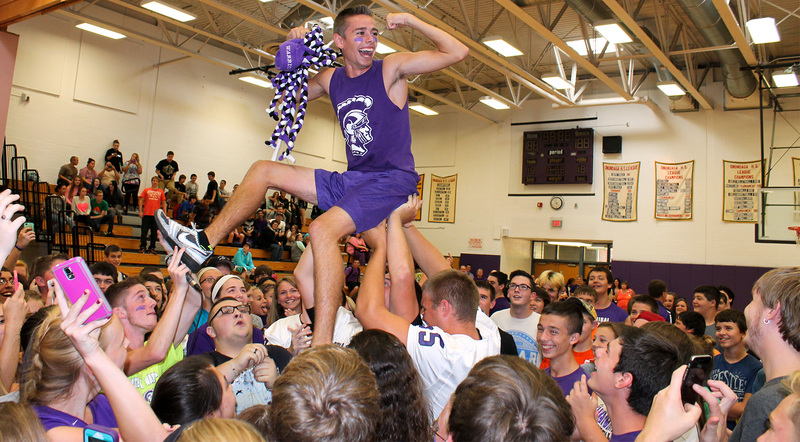 Hannibal High School student Jason McFarland cheers as he is lifted up by classmates during a pep rally. Students and teachers have joined forces to work together to create a more welcoming environment at Hannibal High School. They will work together to boost morale so everyone feels more welcomed and excited about their learning environment, according to Spanish teacher Kristina Licatese. To kick off the 2015-2016 school year, she and social studies teacher Patrick Earley worked to rejuvenate the high school’s homecoming events and pep rallies. Homecoming court candidates were even escorted by teachers. A part of that, she said, includes the sophomore class’ recent teacher talent show. Students also will compete in an upcoming holiday hallway bulletin board competition. Additional activities and assemblies will be planned throughout the year.